Video creation tools—from Skype to PowerPoint to iMovie—have become increasingly popular conduits for foreign language teaching and learning. In flipped-classroom and blended-learning models, video enables faculty to move routine language concepts (i.e., grammar and vocabulary) outside the classroom, leaving more in-class time for live engagement with teacher and classmates. 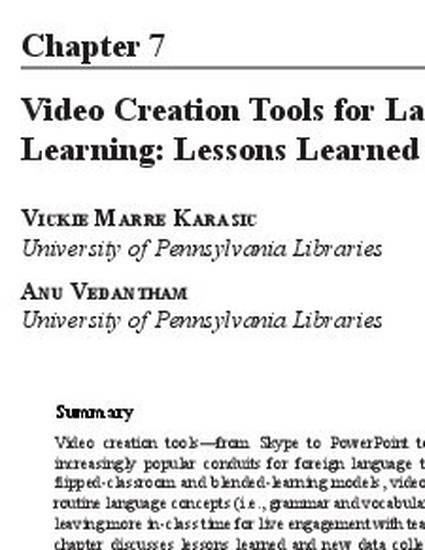 This chapter discusses lessons learned and new data collected at the University of Pennsylvania Libraries’ Weigle Information Commons on video’s effectiveness in various language learning contexts. Data collected includes reflections on several years of course observations, interviews with language faculty members, and a campus-wide survey to gauge student perspectives on video’s role in the language learning experience. Themes that have emerged include the range of video tools available to perform a given task, perceptions of tool usefulness and ease of use (depending on faculty and student technology comfort levels), and the role of the library as a central resource for technology support and course integration. Our study contributes to the scholarly conversation by providing a taxonomy of current tools used, their efficacy in our context as a measure for other contexts, and skills recommended by faculty and staff for effective incorporation of video tools in the language classroom. Karasic, V., & Vedantham, A. (2015). Video Creation Tools for Language Learning: Lessons Learned. In D. Dixon & C. Fuchs (Eds. ), Researching Language Learner Interactions Online: From Social Media to MOOCs, (pp. 107-128). CALICO. See the full volume information.